SARAH PARSONS MOORHEAD was a Boston poet and and artist (ca 1710-1774). Her husband was the prominent minister John Morehead (there are alternate spellings to their name) and her poems concern the religious revival of the 1740s. But I am interested here in her work as an artist and designer. This ad appeared in a Boston newspaper in 1748. Japanning referred to Asian lacquerwork which became popular in Europe and America in the 18th century, local artisans creating works to meet the increasing demand. Two antiques dealers specializing in textiles, recently purchased an example of an early Boston canvaswork and found the name of Sarah Moorhead inscribed under the sand liner. It was originally thought to be her work but noted needlework historian Betty Ring believes that Moorhead was the designer for this piece rather than the maker since other works similar to this were worked by youngsters suggesting that Moorhead was the designer, and perhaps their teacher. 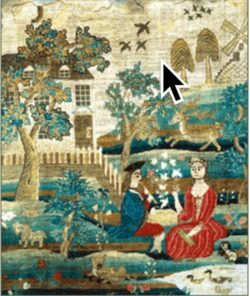 During the 1760s and ’70s American women, boycotting British products, began making and wearing homespun garments. Spinning groups, organized by parishioners, often met in churches. One group met in the home of the Moorheads so it seems fair to conclude that Sarah personally sympathized with the Patriot resistance.